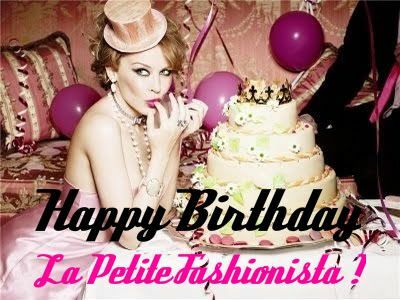 La Petite Fashionista: Happy FOURTH Birthday LPF! I can't believe that my blog is celebrating its FOURTH birthday! It's been an amazing four years writing L.P.F! It's so exciting to see a blog I started as a hobby as a high school senior turn into something so much bigger; it's certainly come a long way! Not only my blog, but the blogging world and its connection to fashion in general has grown immensely since L.P.F. 's inception in March 2007! An ongoing collection of always-changing "latest lusts"
Not only is my blog turning 4 years old, but I'll be celebrating my 22nd birthday in a few days! It's absolutely insane to see how much has changed (& dreams I've followed) since I started blogging. I know it's helped keep me motivated! I am SO thankful for all the incredible readers and supporters of my blog, you're awesome! I'd love to hear absolutely any feedback you have of what you like about my site & what you'd like to see more of! Happy 4th beed! What an accomplishment, I love you blog and your creativity. Keep up the amazing work! That is awesome!! You are one of the only bloggers I know who has kept blogging for so long! :) Happy blog birthday! Happy 4th and 22nd birthdays!! I'm so glad I discovered LPF all these years ago and I'm so glad a made a blogging friend in you! Hope for many more years of LPF. Wow Lauren! It has been a fabulous 4 years and I hope you continue blogging for a LONG time. Yours is one of the first blogs I started reading and I hvae loved it ever since! You have such a happy, positive outlook on life and fashion and it's totally infectuous. And you are such an inspiration! Keep doing what you do! Happy Belated birthday wishes! Good luck and All the Best for the fashion with beautiful and romantic casual love.